Google provides a number of complementary services to support advanced functionality of Google Map. Address geocoding is one such handy service. It facilitates finding geographic coordinates for addresses, locations, postal areas and geographic features in 70 countries around the world (208 in total if countries with partial geocoding capability are included - as at September 2009). Although the primary use of geocoding service in Google Map is for depicting points of interest based on commonly known names (address, locality etc.) and/or for specifying “To” and “From” locations for driving directions service, the underlying functionality can also be used for extracting geographic coordinates of those locations for other purposes. For example, you may need geographic coordinates of your business venues (like shops, offices, meeting places, etc) to depict them on a static reference map for your web site or corporate brochure. 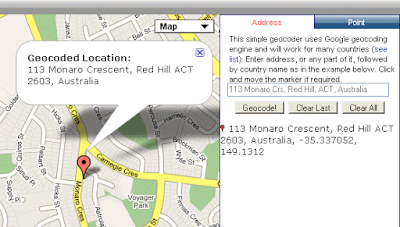 Simple Geocoder is a free service provided by aus-emaps.com to assist in extracting geographic coordinates of points of interest. The points can be identified either by their name (eg full address, town, postal area) or simply by clicking on the map. comments field will provide description as to the accuracy of geocoding process (see below for description of codes). 1 - Country level accuracy. 2 - Region (state, province, prefecture, etc.) level accuracy. 3 - Sub-region (county, municipality, etc.) level accuracy. 4 - Town (city, village) level accuracy. 5 - Post code (zip code) level accuracy. 6 - Street level accuracy. 7 - Intersection level accuracy. 8 - Address level accuracy. 9 - Premise (building name, property name, shopping center, etc.) level accuracy. you can execute multiple searches (one at a time) and then copy the information to other documents “in one go” by highlighting the text and copying it with right-mouse-button-click function. 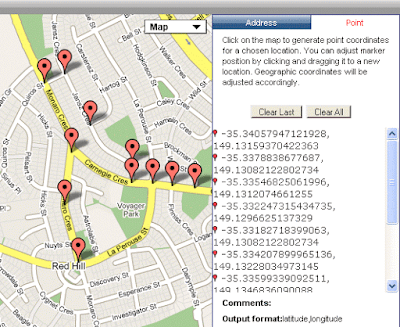 Use “Point” tab to geocode locations by clicking on desired points on the map. This function is very handy for creating vertices for polylines and polygons or where text search described above is not yielding adequate results. Position of markers can be adjusted by dragging them on the map and geographic coordinates text will be adjusted accordingly. Bulk geocoder function is no longer available for free use due to changes in Google service terms and conditions, aimed at protecting commercial suppliers of address data. However, Simple Geocoder will be sufficient for gocoding tasks where small to medium volume of data is involved. You can use SVB Mapper - Microsoft excel add in as well..
Geocodes the data in Microsoft excel. One of the best value for money products in the market. It has won accolades from Microsoft and number of users. Accuracy is much higher in Australia, US and NZ. • Geocode address data and show the address on the map within Microsoft Excel. .
• Create heat maps from Microsoft Excel data . • Identify cluster or concentration and represent them on a map . • Select geocoded points by drawing polygons and use for further analysis. • Perform statistical analysis on selected data. • Use the map within other applications. • Superimpose pie charts, bar charts and text based on multiple features.